If another user on your SecureVideo organization account has invited you to a session, you should be able to join the session direct from your own Dashboard; this is a type of session also known as "host-to-host", as both sides are account holders. Here is a step-by-step guide to joining those sessions. 2. To enter the waiting room of a fellow account holder, click the "Enter Waiting Room" button under the scheduler's name. (If there are other participants invited to the same session, you will also see their names in this session panel.) Then wait for the session scheduler to start the session. Instead of an access code above the button to connect, there is your host's phone number. There is no option "Manage" for the session. There is no option "Add Participant" for the session. You can view the names of other participants for the session, but cannot affect them. If you have declined a session, you may want to hide it. 1. 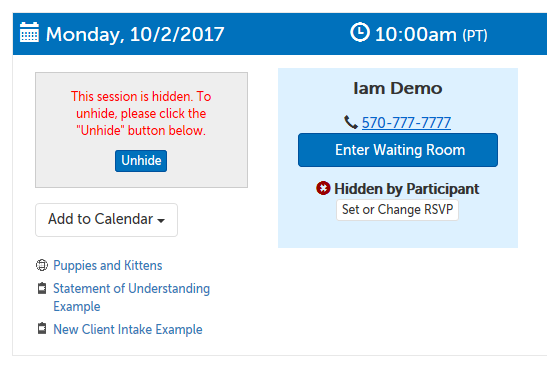 Click on the "Hide" button on the left-hand side of the meeting panel. 2. On the popup that appears, click "Hide Session" to confirm. Your host will also see that you have hidden the session. If you have hidden a session by mistake, you can unhide the session if it is still active (i.e., not expired or cancelled). 2. All hidden sessions will be expanded temporarily. Click on the "Unhide" button to confirm you would like that meeting to display normally again. This article was last reviewed by our Support team on September 7, 2017.